Even if you aren’t an insider in the glamorous world of diamonds, you have probably still heard about the 4C’s of diamond sales. They are Cut, Color, Clarity and Carat. But explore a little deeper into the diamond buying process you will come across another C, of which most customers are not aware: “Certificates”. For most newlyweds, a diamond engagement ring is one of the biggest and most important purchase they will ever make. To prepare for that moment, most people do research online, browse jewelry shops, and in the evening try to figure out their partner’s ring finger size while they sleep. Now at the moment when you‘ve picked out the perfect ring with the perfect cut, color, clarity and carat, what do you do if you find yourself asking the question, “how do I really know that this ring is what I think it is?” Not every diamond comes with a certificate and often to the untrained eye, natural and fake diamonds might appear identical. But they are not. Diamond certification plays an important role in ensuring that you are getting exactly what you are paying for and not, getting cheated or taken advantage of. While there are dozens of diamond testing laboratories across the globe, only a hand full are relied on globally. GIA is one of them but surely not, the only one. In order to be accurately graded, a diamond’s 4’Cs must be scientifically measured and evaluated. Gemologists working in secure laboratories use high-powered microscopes and other tools of the trade to grade each diamond. Upon completion of this process the lab provides a report specific to that single diamond. The certificate issued should ideally follow the glittering stone no matter, how many times it is sold and bought. In the trade, the diamond would be referred to as a ‘certified diamond’. Certified diamonds generally carry a premium price, so a seller would be unwise to try and pass a certified diamond without its corresponding certificate. Diamond certificates are high utility instruments, they not only help identify diamonds as being natural but also, rate their internal and external characteristics scientifically and accurately. You might be surprised to know that it is not only novice and first time buyers that, benefit from diamond certification. Seasoned diamond veterans, often refer to specific certificate details before setting or bargaining on the price of a specific diamond. 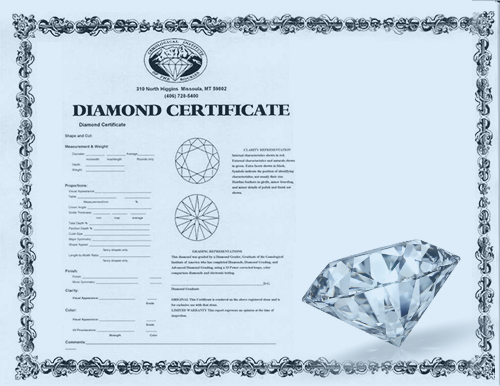 The process of linking a certificate to a specific diamond has been taken to the next level. You can now request for a laser etching to be done on the girdle portion of the stone. The unique certificate number that was issued for the stone is clearly but, very minutely etched on the diamond. It is also common for diamond certification laboratories to maintain online databases that, can be searched based on issued diamond certificates. The importance of diamond certificates is that they mitigate the risk of a non-reputable jeweler taking advantage of a customer unfamiliar with diamonds. Reputable jewelers always have certifications available for customers to review. So remember, if you have any doubts do more research and get a second opinion. GLITZKOIN is poised to deliver a superior blockchain based diamond trading platform. Once implemented, the hi-tech platform will improve efficiency and market scope for diamonds across the globe. Strict processes will be put in place to ensure that, only certified diamonds will make their way into the blockchain. GLITZKOIN is the only diamond blockchain effort to be actively supported by veterans from the 90 billion dollar diamond industry. The project also includes the deployment of a crypto currency that, will be used to settle payments on the trading platform.